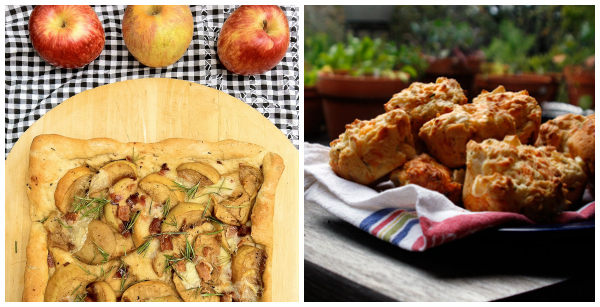 Fall recipes are warm, cozy and conjure up the season's sweetest gifts: apples. So we've gathered food bloggers' best and simple apple recipes, the ones you need to make and must share! From apple crisps to apple desserts to apple appetizers, your go-to easy fall recipes are all right here! Laura Bashar is a former graphic designer and now a stay-at-home mom of three letting her creative side roam free in the kitchen and behind the camera. Her creative apple recipe is Apple and Avocado Salsa. 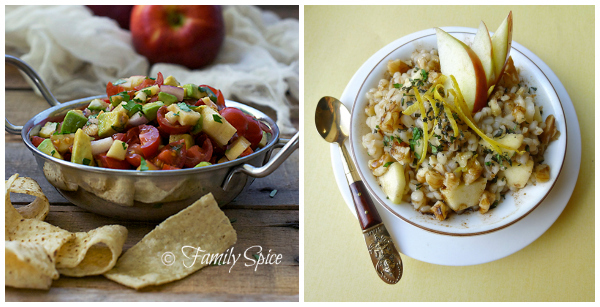 Laura says, "Add some crunch to your salsa with apples. You can go sour with green or sweet with your favorite red!" Carlene Thomas R.D., L.D., is the blogger behind Healthfully Ever After, a healthy lifestyle blog dedicated to becoming healthier and happier before and beyond "I do." Her healthy apple recipe is a Walnut Apple and Barley Salad. Carlene says, "With a variety of textures from the crisp apple and crunchy walnuts, plus the aromas from the lemon zest and herbs, this salad is an eating experience and a perfect side or start to any meal!" Deanna Segrave-Daly is a food-loving dietitian and co-blogger at Teaspoon of Spice. Her unique apple recipe is Apple, Brie & Bacon Focaccia. Deanna says, "Add apples to this pizza-like recipe for a delicious sweet, creamy and smoky focaccia! Dacia Rivers writes about cooking for her two small children and trying to grow them into healthy and adventurous eaters at Eat It Kid. Her perfect apple recipe is Cheesy Apple Biscuits. Dacia says, "These biscuits are a nice mix of savory and sweet that entice young eaters and offer more complex flavors that adults enjoy as well!" Amanda Prince is the blogger behind The Sunny Vegan. 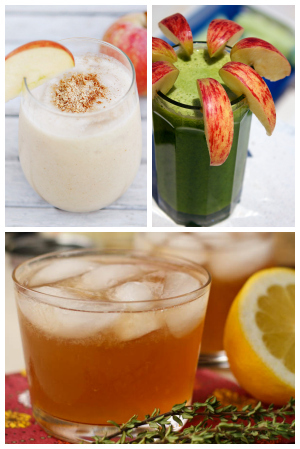 Her scrumptious apple recipe is an Apple-of-My-Eye Pie Smoothie. Amanda says, "This is a treat that I don't feel bad giving to the kids. It's cool, light and tastes like an indulgent dessert!" Yasmina Ykelenstam is an ex-CNN and BBC journalist, author of six low histamine e-books and the founder of The Low Histamine Chef. Her apple recipe is Green Goddess Juice. About her healthy, delicious green juice, Yasmina says, "This is a quercetin and other bioflavonoid rich antihistamine juice I came up with for people with allergies or histamine intolerance." Lisa and Anna are the two friends behind the blog Garnish with Lemon, a food blog to liven up your family meal. Their tempting apple recipe is a Bourbon Apple Autumn Cocktail. Lisa and Anna say, "This is an autumn cocktail with a blend of bourbon, applejack brandy, apple cider, thyme simple syrup and fresh lemon juice." Jennifer Drummond cooks and blogs at Peanut Butter and Peppers, a healthy living blog that takes everyday food and makes it healthier without sacrificing the flavor. Her amazing apple recipe is Apple Frozen Yogurt. Jennifer says, "This is a sweet frozen yogurt made with apple cider, cinnamon and fresh apples, topped with whipped cream and crushed cinnamon-sugar pita chips." Julie Grice writes about food science, menu planning and her favorite recipes at Savvy Eats. Her delicious take on an apple frozen yogurt recipe is Brown Sugar and Apple Frozen Yogurt. Julie says, "Sweet sauteed apples add a nice texture and flavor to this brown sugar frozen yogurt."